COLOGNE, Germany, and MOSCOW — The U.S. military is slated to deepen its logistics footprint in the former Soviet Bloc country of Poland, and contrary to recent proclamations from the Trump administration, NATO is actually paying for a share of it. The depot is meant to stash U.S. war-fighting equipment in the eastern European nation in case a confrontation with nearby Russia becomes a possibility. Pentagon officials consider the future facility in Powidz, western-central Poland, part of a global network of hardware stashes meant to serve as faraway armories for U.S. soldiers when there is fighting to be done. “Current plans call for 650,000 square feet of controlled humidity warehouse space, a vehicle maintenance facility and supporting facilities,” U.S. Army Europe spokeswoman Beth Clemons told Defense News. Another 58,000 square feet is designated for earth-covered ammunition magazines. “The facility will operate at a very high level of readiness – with vehicles, communications, weapons and munition deployable at a moment's notice,” she added. Following approval of the funds last month at the alliance level, construction of the site is slated to begin this summer and take about two years, NATO Secretary-General Jens Stoltenberg told the Wall Street Journal in a recent interview. But the decision to build the depot was made some years ago, predating Poland’s formal “Fort Trump” proposal, an attempt to flatter U.S. President Donald Trump into deploying a permanent American troop presence in the former Soviet Bloc country. Former U.S. Army Europe head Ben Hodges is on record in 2017 envisaging the Powidz air base as a hub for American forces on NATO's eastern front. The Army Corps of Engineers published an industry solicitation in 2018 requesting tree-cutting services for 38 hectares, or 71 football fields, around the base. Money for the project comes from the so-called NATO Security Investment Program, or NSIP, to which all 29 alliance members contribute according to a key tied to their gross domestic product. As the wealthiest contributor, Washington's share is capped at somewhere between 20 and 25 percent of a given project. U.S. defense sources cautioned that the Powidz storage site should not be taken to mean that the Trump administration is also considering any kind of permanent troop footprint in Poland. 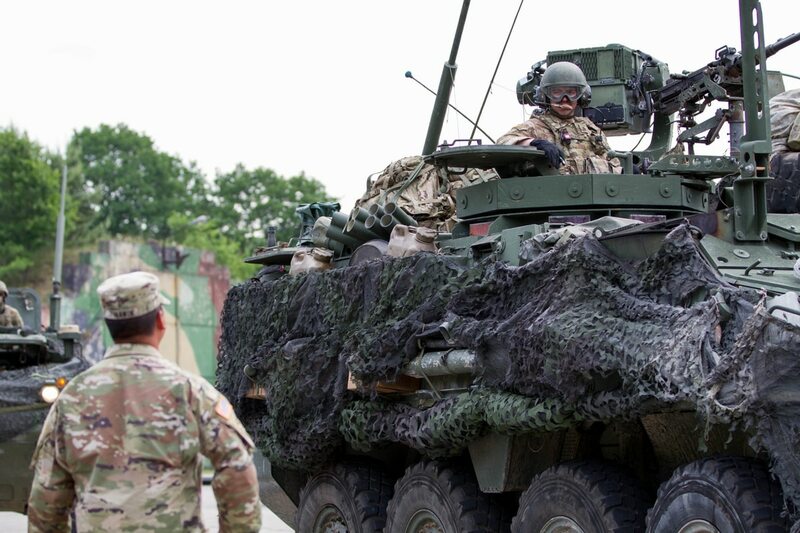 For now, at least, Washington is simply treating the facility as one of five sites across Europe capable of scrambling together the equipment to make up an armored division when needed. NATO officials said the Powidz site is an outlier in an alliance program that normally funds infrastructure upgrades anywhere between a few hundred thousand dollars and several tens of millions. Additional smaller projects in the pipeline target facilities in the Baltic nations and Turkey, for example. The Trump administration requested $144 million for the NSIP program for fiscal year 2020, compared to a $171 million request for 2019. Poland previously proposed to pay for U.S. forces to be permanently stationed there, but is it practical? Low-level officials have echoed this sentiment, but the Kremlin has been quiet. As with the Russian reaction to the downfall of the INF treaty, senior leadership is likely to stay out of the fray until there is a concrete development to react to. And even then, Moscow’s counter-moves are unlikely to be any more specific than Putin’s position on INF and possible U.S. missile deployments in Eastern Europe: “We have to ensure our security,” he said in December. Fort Trump would certainly give the Russian government a perceived justification to deploy more troops and equipment in its Western Military District, and bolster support for the Kremlin’s military spending at home. But, according to Vladimir Frolov, an independent Russian foreign policy analyst, “there might be some marginal increases, but we are already maxed out in the Western Military District and in Kaliningrad,” a small exclave between Poland and Lithuania. The Belarusian government has at various times since Moscow's annexation of Crimea from Ukraine made overtures to the U.S. and European Union, but Minsk plays a delicate balancing act between the West and Russia – with which it is economically, politically and culturally intertwined. Over the past year, Belarusian officials have asserted their military is sufficient for their national security needs and that accepting a foreign military base would not contribute to regional security. But they have also warned that a new U.S. base in Poland could change that calculus. Meanwhile, there are a few planned U.S. investments in Powidz that could be sacrificed to pay for President Trump’s controversial border wall with Mexico – an ironic twist of fate for a government in Warsaw eager to please Washington. Among them are a bulk fuel storage facility, worth $21 million, and a “rail extension and railhead” project budgeted at $14 million, according to a Defense Department fact sheet. Those expenditures run under the heading of the European Deterrence Initiative, a Pentagon account independent of the NATO funding stream. Some projects under that initiative, including in Powidz and elsewhere in Poland, fall under a recent Defense Department directive that says overseas construction projects not put under contract by October could become bill payers for the U.S.-Mexico barrier. But upgrades to the rail connection for the storage site are essential, Hodges, the former former head of Army forces in Europe, told Defense News. That is because the architecture and ramp space of the existing cargo loading dock is wildly insufficient to accommodate the type of high throughput envisioned for a high-readiness depot. For example, the existing one-line setup was built for side-loading of tanks into rail cars, a typical feature of Soviet-era logistics planning. That technique works for relatively light tanks, but not for the much heavier, modern U.S. tanks, Hodges explained. What is needed, he said, are end-loading ramps, where tanks roll forward along the length of the rail cars to enable a smooth and quick transfer. “Until the railhead is developed, it will be a limiting factor,” Hodges said. The question of permanently stationing U.S. troops in Poland, for which Warsaw is prepared to pay $2 billion annually, is still unresolved. Some military officials have said they prefer retaining elements of the rotational scheme that is currently used to manage between 4,000 and 5,000 U.S. service members working in the country, many at the Powidz air base. According to Hodges, a rotational forces make sense especially for the Reserve-heavy jobs in logistics and maintenance that would be required by the new armor and ammunition storage site. Others have said a mix between both deployment types would be ideal. Air Force Lt. Gen. Tod Wolters, nominated to lead U.S. European Command, told senators at his April 2 confirmation hearing that he would continue the rotational track. Defense Department officials were expected to submit their assessment of the Polish offer by March 1, though sources said the department has requested an extension because preparation of the fiscal year 2020 budget proposal interfered with the timing. As mandated by Congress, the Pentagon analysis is expected to include a section on “political considerations” within NATO of permanently stationing U.S. troops there. Also requested by lawmakers is an analysis of what actions Russia may take in response. Whatever decision the Trump administration makes, if any, the NATO angle should be taken into consideration as an important criterion, Hodges argued. “I’m really glad they [lawmakers] put that in there,” he said. As for Russian pressure on Belarus to move its military into the country, Hodges noted that there are already construction projects underway to store military equipment and fuel in support of joint operations. “Clearly it's in the best interest of everybody that there are no Russian ground troops in Belarus,” he said.